University: Best place for take away coffee; best place for coffee, if staff know you. In the second stop in my campus tour, I took a wander over the road to Azzuri, hidden down a maze of staircases some how on Darlington road. Azzuri’s is a really little piece of the Art’s faculty, which somehow got lost and ended up near engineering. 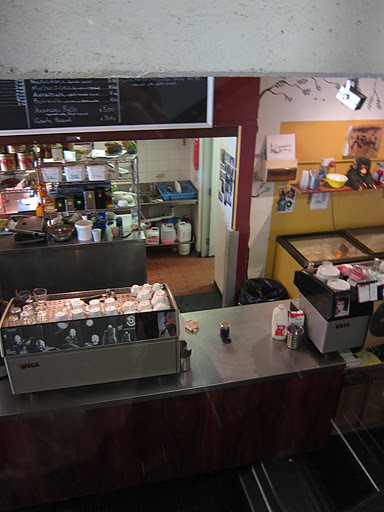 It’s a quirky place, which for a long time was known as the only place to get good coffee on campus. It’s the kind of place you dream of fitting in as a 18 year old, and the kind of place which at 26 you just keep coming back too. I order a flat white (as per usual), and it comes to me in a reasonably quick manner, especially given the churning speed of the café and coffee orders. It comes in one of a few china cups the café has, and looks pretty good. has a bit of a coco taste to it. The flavour certainly blends well with the milk, and its easy to drink over a long period of time. The nice thing about Azzuri, is truly your ability to sit here all day if you wish, it’s a student café to the core, and I find the owner and the staff, ridiculously friendly, especially if you’re a regular of 1 to 6 years like myself. You find, if you go there enough (few weeks), they know you by name quickly and make your drink with extras, like a smile drawn on the cup or an extra free shot, if you’re looking tired. The other hidden thing about the café is its food menu, and while I am not a food blogger, they do mass-produce some good fast meals, far better then all other food places within near walking distance. Overall I am a fan of the café, it’s a place to study away to some trance, while mixing with arts and law students who somehow managed to find their way across City Road. Popped by after a late night of writing to grab a takeaway coffee from Azzuri. You may remember, I want here a few days ago to have a sit in lunch (Just above, so you don’t have to recall too long ago!). Azzuri, even at 9am (early student time) was packed, with a long line creeping its way around the counter. The line moves quickly, which is nice, as I am desperate for a coffee. As I mentioned earlier, having been going here for years, the staff all know me by name, and Chris the manager (not my mate, different Chris), put my drink in the queue before I had spoken anything. Made reasonably quickly, around some busy banter from the baristas, the coffee is one of many produced on the spot. You may be worried at this point that as the staff seem to know me, special attention is paid to my drink. However, good or bad this is often not the case in the mornings, where the demand is just too high and coffee’s moving down the production line too quickly. The coffee is poured well, with attention put into the ratio of foam to milk. This can be done, for the unknowing, if you order the drinks in terms of foam quantity. In a high foam jug, cap first, then latte, or latte first then flatwhite. Presentation wise, its nothing exciting, its in a white paper cup, there are a few coffee stains on the side. However, the bug plus is the little bit of free pour art. There is simply no reason to do this for a takeaway, but as they serve it to you without a lid (to allow you to put sugar in as you wish), it really adds to the appeal of the drink. I rate this higher then some of the ‘for-here’ drinks I have had to date. Taste /smell wise, to be fair to Taste Baguette, I put the lid on. Even with the lid on, it smells great, their Coffee Roaster beans, while no Campos, work really well, with a pleasant cocoa aroma rising off the drink. I know before I take a sip that the coffee is a little to hot for my taste, however, on drinking I don’t find it burnt, although it burns my mouth a little! Onto taste, it’s a really pleasant drink. I find the coffee balanced really well, it seems to have been near perfectly extracted. The drink reminds me of something slightly fruity (berries?) mixed with a touch of cocoa and something kinda roasted. After taste is minimal, and I find I keep going back. I can’t completely recall, my sit in drink here, but I believe this one, tastes better. Such a taste differences makes me feel that they calibrate their grinders to the humidity in the mornings, and neglect to do so as the day goes on, unless the extraction rate changes dramatically. So, I would recommend coming here in the mornings.